Have been helping Annie Hysterical check details of NME archives to make sure her installation for Ladyfest earlier this month wasn't too skewed by the fact of there being a few missing copies. We were pretty sure Annie wasn't misrepresenting anything, given that the sample used represents easily the vast majority of copies in the period shown (1989-2008). But people have been starting to ask questions for academic purposes, so we wanted to make sure it was watertight - that a large number of covers featuring females hadn't randomly been left out of those Annie had acquired for some reason, for example. - the one female in question being Scarlett Johansson, since I'm sure you're curious. I do happen to think Scarlett is a wonderful singer; but I'll leave it to you to decide if you think that's the main reason she was the only woman to get a solo cover from them that year. so it seems we had nothing to worry about, and in fact if that year had been better represented the 'male' pile in Annie's installation would be even more dominant. But beyond that, and rather sadly, the magazine seems to have given up any pretence this year of focusing on new music. As far as cover star slots for the last 10 issues goes - 3 were taken by the Stone Roses, 1 The Ramones, 1 David Bowie, and 1 The Rolling Stones. This week's cover features Muse, announcing, "We're opening a door into the future!" Sounds like someone needs to. 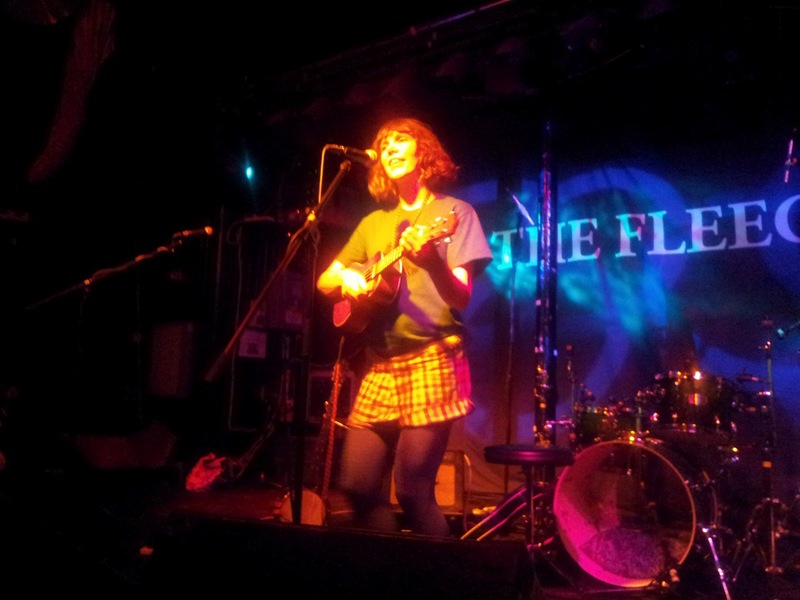 Strange thing at Bristol Ladyfest, the latest installment of the global feminist festival phenomenon instigated in Washington 12 years ago by female artists including Sleater-Kinney: as pointed out by Katie Allen, the vast majority of the audience were unavoidably, visibly male. Katie asks "do men support Ladyfest more than women?" 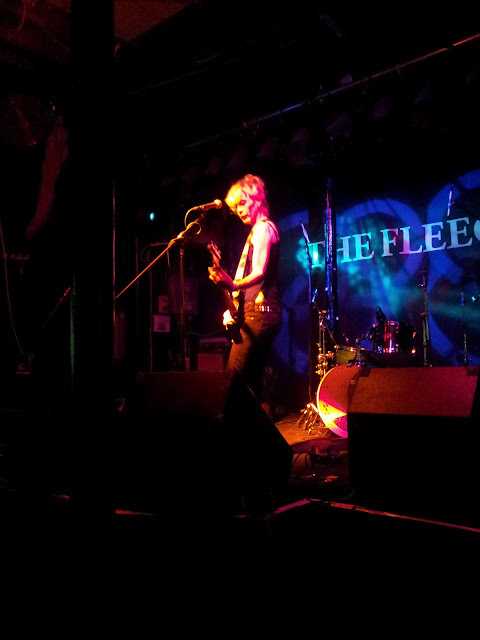 In absence of other information, it's tempting to simply assume that the music audience at Bristol 2012 was a blip, and that Ladyfests in general benefit from female participation on the floor as much as on the stage. 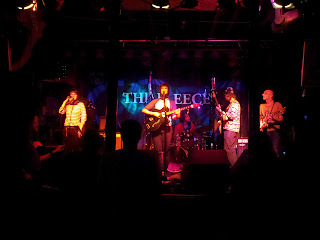 The other possibilities - either that the general sense of machismo-fuelled barriers to getting involved in music (which some female friends have talked about with me)* extend even to a female-run celebration of female creativity such as this; or, secondly, that women just aren't as interested in independent music as men - both seem implausible. But it was curious. This was my first Ladyfest - what are others' experiences? Was this a blip? They're usually not mostly attended by men, are they? Rita Lynch followed by way of stark contrast. Her songs are visceral stories, she puts everything into it on stage, and it's captivating. Annie was inspired by it. It was only when it finished that I realise she did all that with just her voice and a guitar. The Horn the Hunt have come down from Yorkshire for Ladyfest... we're glad they did. There is a shamanic sense to this four-piece's anthems. You feel at any point they could pick up a flag and lead everyone out of the venue, still singing and drumming, on some euphoric march to the mountains. Lead Hunter, Clare Carter, reminds me of no-one more than the otherwise-incomparable Jemma Roper - admittedly partly because they have a similar look, but they also share a kind of confidence in carrying their cantations from the other side. 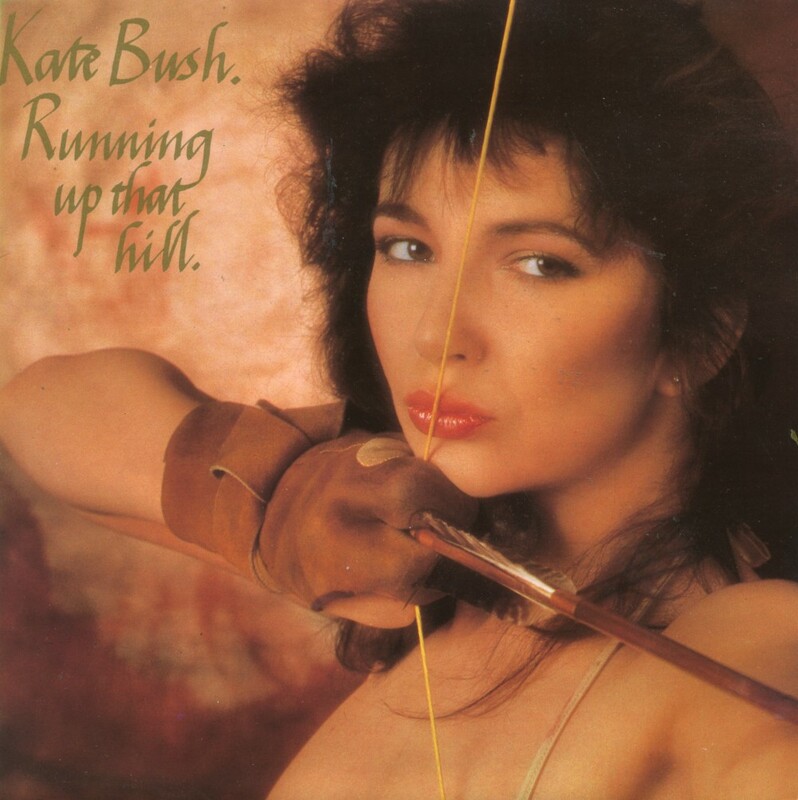 It could also do well for people who can't get enough Kate Bush in their lives (No bad thing either). 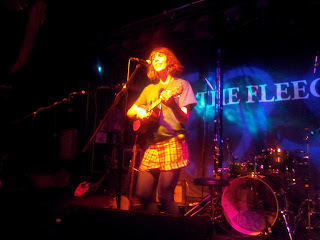 I missed too much of Straylings to comment, likewise Rozi Plain who came later. My loss in both cases, I suspect. Rachael Dadd performed with a baby bump for what in some ways marked the first part of what could be seen as an extended performance from herself, Rozi Plain and fellow Whalebone Polly-member Kate 'This is the Kit' Stables, sharing as they all did each other's stages and to some extent sensibilities. They are a loosely geographically distributed collective [members at times as far away from the homeland and each other as France and Japan], but close-knit (and they surely do knit together). All this will no doubt sound nauseating to some who don't know them or their work, but the truth is they simply ooze charm and are good enough to confound any churlishness. 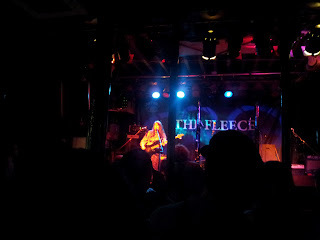 For me the highlight of Rachael's set was her homely, rustic, relaxed song about making rice triangles(!) Its thrice-repeated lines echo the product, and its whole mood took us to a kitchen with a wooden floor somewhere in Japan, away from Tokyo. 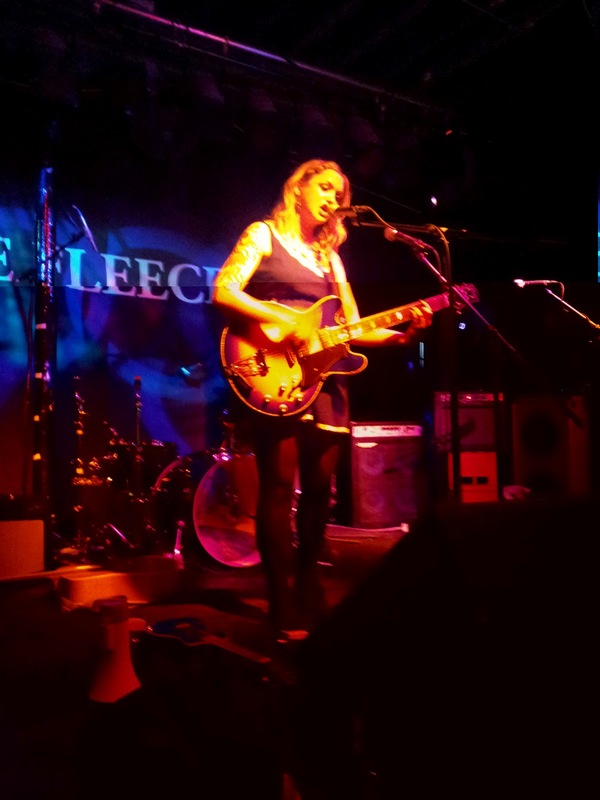 Just like Rachael (and Annie who follows her on stage), Laura Kidd of She Makes War is a maker of things as well as music, and had been set to exhibit at the Ladyfest exhibition the following day. This was the third time I'd seen SMW live; the first two occasions were as support for Hysterical Injury. Not that those performances were any too shabby, but I think that her music had more room to breathe on this Ladyfest bill, where the edge and emotion in the songs weren't swamped by comparison to the relatively untamed noise of some of the bands at those gigs. It's also possible to be distracted by all the trappings - her sequinned cheeks; the aforementioned artistic bent; and sharp, at times self-deprecating wit ("Sorry, I have some albums for sale, sorry, I hate saying that, sorry...") Ignore those margins to focus on the performance, though, and there is more to it than show. Her glamorous visage distorted in expression at the heart of songs like 'In this Boat', to leave little doubt about the soul behind them. As much a success as Ladyfest felt, it was a pity we couldn't ever quite say the Fleece was rammed; not only because it was for good causes, but because the top three billed acts in particular - This is the Kit, Shrag and Mary Epworth - would look good on anybody's bill, leaving gender and politics aside. 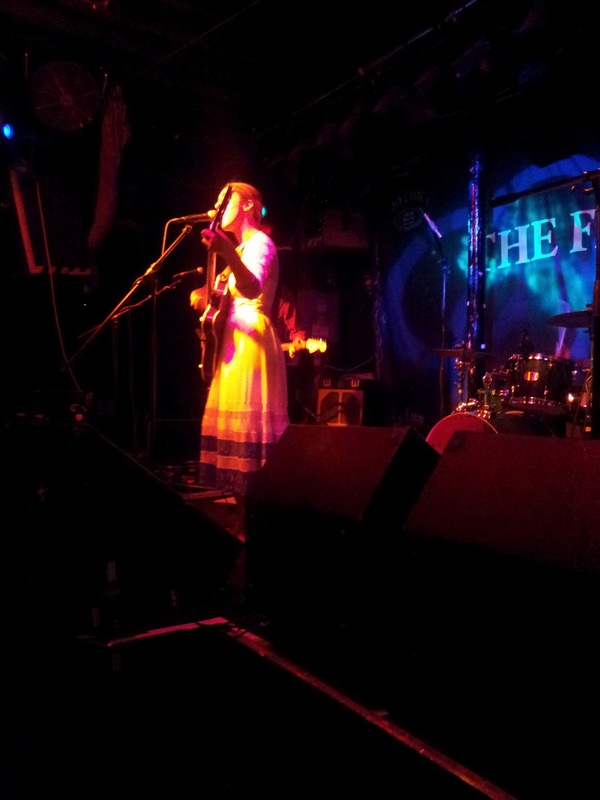 Mary Epworth was in full swing when I caught up with her set. It's hard to pin down her music, it comes across in a way that makes the (presumably slightly tongue in cheek??) description currently up on Wikipedia ["Mary Epworth makes music influenced by traditional English song, 60s west coast Psychedelia, and Greek Progressive Rock"] - seem entirely plausible. 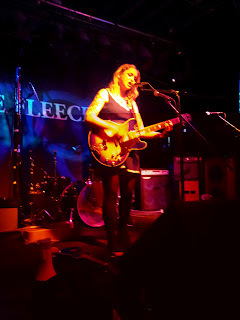 She stands right at the front of the stage, belting out folk-gothic lyrics ("There like a brace of blackened bone / think they know more than us" - 'Black Doe'), with an incongruous country swagger and alpha grin, like Smoke Fairies in a spectacularly good mood - or - um - Queen Adreena covering Dolly Parton, if you can imagine such a thing. on purpose, because it's Ladyfest. Honest. So I finally get to see Shrag! (or Sussex Heights Roving Arts Group, to give them their full, long-abandoned title) I've wanted to see them for years, and their Rabbit Kids video featured on the first post of this blog. 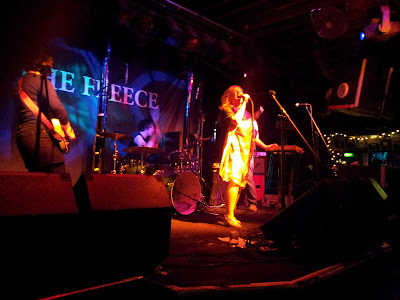 They are every bit as raucous and infectious live as their recorded tracks suggest. Lead vocalist Helen King in particular jerks, jumps and bunches herself up as if possessed by the songs throughout. Their brand new album Canines is out now. And finally a (happily) long day comes to an end with This is the Kit, whose band tonight boasts among others Rachael Dadd and Rozi Plain from earlier and Neil of The Liftmen on guitar (and that is something to boast about). A couple of people during the day had voiced their uncertainty to me about the wisdom of This is the Kit headlining; suggesting that a quieter, calmer band wasn't right to finish on. And admittedly this would have been a daunting bill to top for many performers. It's a big mistake, though, to think of Kate Stables and her outfit as 'fey' or 'whimsical' in that way that way that sometimes really means 'flimsy'. While she's singing, she adopts a serious, determined countenance that belies the easy, lighthearted banter that comes between songs. Also the band she surrounds herself with - both in numbers and talent - back her swift-like, easy-sounding vocal acrobatics with a full, rich sound; especially while Rachael Dadd picks up her clarinet. 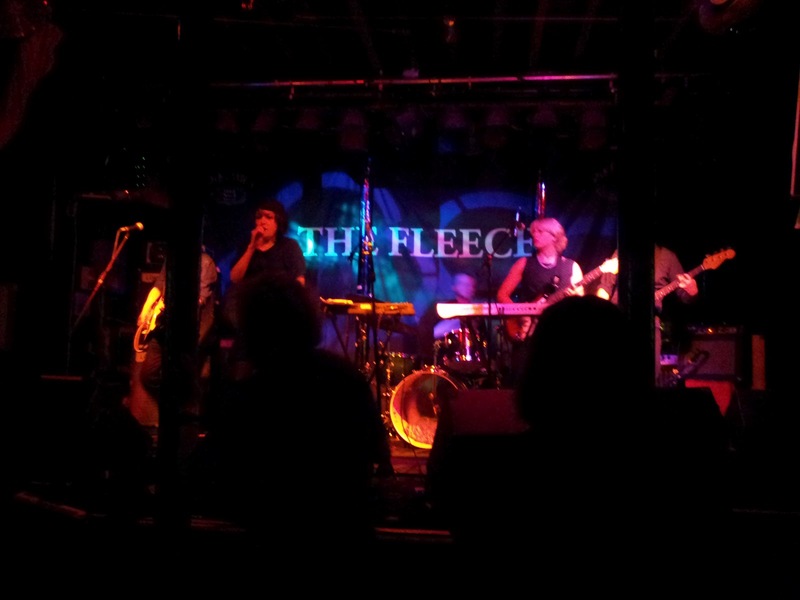 Both of these things - the attitude in and between songs; and the easy complexity of them - reminded me of nobody more than the last act that brought me to the Fleece - the justly vaunted Field Music. And all of that adds up to an experience that is right, natural, brilliant, sublime. *In case anyone reading this is wondering why women might feel excluded from music in this day and age, and why people feel a need for events like Ladyfest, one only needs to consider Annie's shocking-if-not-surprising image, at the top of this post, to understand how 'music' might feel like a scene in which only men are allowed access. 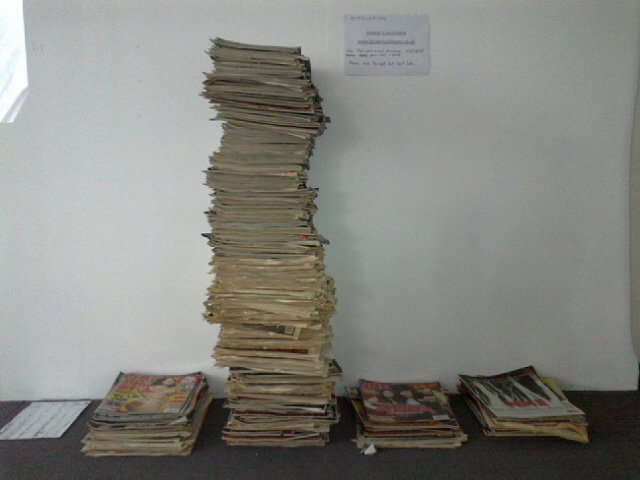 Her installation, made for this event, collates copies of NME over a 20-year period of the 90s and early 2000s, sorted according to artists on the cover, by gender: Female - Male - Both - None. It drives a skewer through the idea that access for women, much though it might have moved on, has become close to 'equal' in the last 100 or 500 years. Incidentally, in the last few weeks that same magazine has also shown it can't tell one major female artist in that period from another, and squandered their review of the peerless Gaggle's debut album by taking it as an opportunity to insult feminist stereotypes. Some work to do there, perhaps.